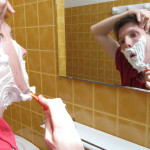 When will I grow noticeable stubble? Posted July 9, 2015 under Ask Us. “Stubble,” or hair growth on the face, is due to several factors: the number of hair follicles on the face and neck (usually genetically determined) and the presence of the androgenic hormones testosterone and DHEAS. These androgenic hormones usually begin to rise in early to mid puberty and continue to rise throughout puberty. The age at which boys go through puberty varies widely – some boys start as young as 9 and others as late as 14. The first sign of of male puberty is enlargement of the testicles, which is where the testosterone is made. Even if you are progressing through puberty normally, you may not develop much hair growth on your face if your family pattern is not to have much facial hair. If you have any questions about how your puberty is progressing, please see your local health care provider who can do an examination and further evaluation as needed.